Here's another movie from 1996 but this one you should avoid. What a horrible misfire of a movie. Women will sneer and probably say, "Oh, you just don't like chick films." Piffle. To borrow an idea from Oscar Wilde, I'm not interested in whether a certain film is a guy film or a chick film - I only care whether it's good or bad. 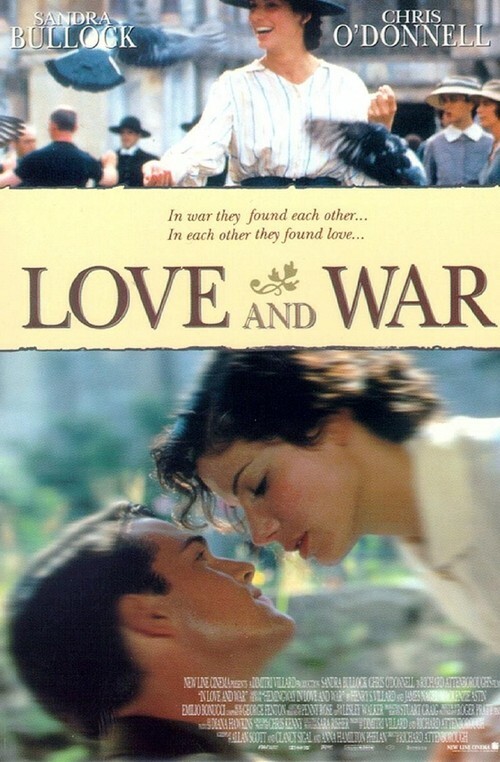 To tell the truth, I eagerly awaited the arrival of In Love and War (1996) in the theaters. It promised an epic-scale wartime romance (I've forgotten how many times I've watched Casablanca, folks), and it threw in my then dream date Sandra Bullock for icing on the cake. Besides, it was directed by the great Richard Attenborough. I'm a sensitive, romantic guy, you know, and on the day this film arrived, I was there with a very special date. I had to elbow an elderly couple away from the shelf, but I managed to snag the last tickets. If you've ever wondered why the English have a reputation for being lousy lovers, check out this film. It's supposed to be a love story - about the young Ernest Hemingway falling for a Red Cross nurse in an Italian hospital - but it contains nothing that even remotely resembles passion. Chris O'Donnell and Sandra Bullock, as much as I like them both, are simply miscast to begin with; moreover, there's no way they can generate any sparks given the wet noodle of a script they've been saddled with. They end up looking pretty foolish. Richard Attenborough should have directed this fiasco - by fax, apparently. The kindest thing I can say for him as a director, in general, is that he didn't ruin Closing the Ring (2007). In addition to a real script, this movie about Americans in love needed an American sensibility and not the proper British reserve Attenborough anesthetized it with. This is a very empty, very dull movie, boys and girls. The sad thing is, a lot of women probably took some heat after making their husbands or boyfriends view it. Avoid!